Moving backwards in time again, here's a great Shankar Jaikishan score. 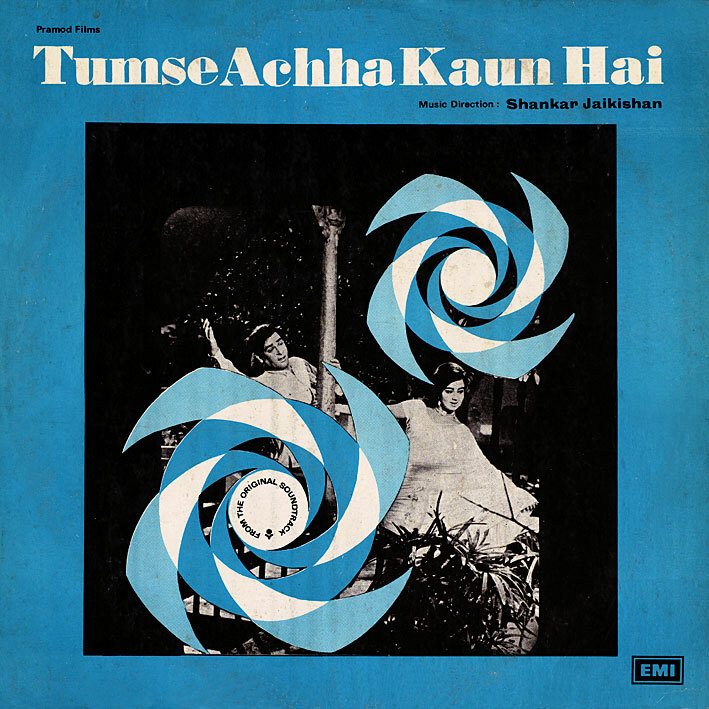 'Tumse Achha Kaun Hai' [review] (1969; soundtrack first released in 1978 though) is an album of two halves - side 1 all sweetness and light, gorgeous melodies, check out 'Janam Janam Ka Saath Hai' and the delightful 'Rangat Teri Surat Si' - and full on Masala Beat when flipping the record over... if you like 'Jan Pahechan Ho' (the one from 'Ghost World'), you're gonna love Mohd. Rafi's similarly flavoured 'Kiss Kiss'. Great fun! I've posted a few gems from my collection for you on my page. Thanks for sharing! "Loafer" PLEASE!! Expect Loafer in about a month or so; I'd post it sooner but it hasn't been ripped yet, haven't got time to do it at present so there's going to be a handful of albums I've already done coming first. I was not able to open this one. Corrupt? Strange... downloaded it myself just now, and it opens and plays find at this end. Anyone else having problems? Yep, I could only get like 275K from it; I tried redownloading it, and it told me I was already downloading a file, which I wasn't as far as I knew..
Hmmm... might be some temporary sand in the easy-share machinery though... has anyone actually been able to download the whole thing? Let me know. And if not, I'll try re-uploading. Well I was just now able to successfully download it and am listening to it right now, and it sounds great!! Thanks for such a great page, I always look forward to your new posts here! Thanks for the great post i loved the album and looking forward for the hare rama hare krishna. This is a killer score, possibly the best you've yet posted. I've always been a big Mohd. rafi fan, so I was probably bound to love it, but there's a great mix of styles here. Thanks for posting these albums. I've really enjoyed hearing this music. The albums are great but Easyshare blows hard. This was another one that only partially came through and won't open. Any chance of a re-upload of this one? Can you please re-up this album, the previous link expired. Thanks a lot in advance !. No it hasn't, still working. That's weird, yesterday I clicked the link twice and both times it mentioned that the link has expired.